Elementals, or the physical manifestations of the natural elements, possess energies that embody their element. 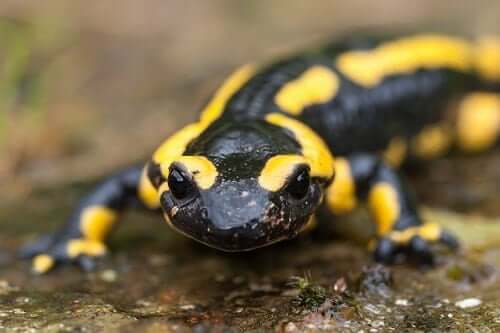 Salamanders are the elemental of fire. This concept comes from the scientist Paracelsus in the 16th century. He is also credited for his thoughts, observations, and naming of the three other elementals in nature. These amphibians are real animals that can be found in nature. However, they have also long been associated with the mystical occult realm in pre-modern literature. As a legend, the salamander was often depicted fairly accurately in relation to its physical form – that is, they manifest themselves in a lizard-like form. However, they were were described as having an affinity to fire, specifically fire of the elemental nature. In old fables, salamanders were said to have taught ancient mankind how to create and use fire for survival. There is a slightly tricky aspect to the character of the fire elemental salamander. It has no real relation to the amphibious salamander. The closest connection that these two have concerns the amphibian salamanders living in moist logs, which were often used for fire. Once the logs were chucked into the fire, the salamanders would come scurrying out. Thus, some ancestors deemed those “normal” salamanders as birthed from fire. The fire connection then seems understandable, albeit naive. Salamanders were also cited as highly poisonous beasts of mythology. St. Elmo’s fire was also believed to be a result of fire salamanders. This weather phenomenon occurs when a luminous plasma is created by a coronal discharge from a pointed object in a strong electrical field. The most common examples occur during thunderstorms and volcanic eruptions. Salamanders were considered the cause of these electrical discharges, as it was assumed that they produced electrical fields of energy. It was also assumed that these creatures lived in volcanos. If the volcano was dormant, it meant that salamanders were to be found inside, content and sleeping. When the volcano was erupting, though, the sentiments were not so great. These conditions indicated that the salamanders’ wrath was unfolding and that their lava tongues would soon come up to lick (a.k.a. destroy) everything in their path. From a non-weather perspective, salamanders were viewed as controlling great, radiant orbs of fire. Imagining these creatures as possessing personalities allows us to draw even deeper and more thorough conclusions about them. Like other solar and fire creatures, these salamanders boast of wild and bold traits. They take pride in being feisty, sultry, and lively. Their seemingly never-ending energy is contagious to all those around it. Although they definitely seem like the party animals of the spiritual world, salamanders also possess symbolism of a more sophisticated nature. They bring about a passionate and commanding energy that drives us to seek knowledge and wisdom. By taking in the illuminating qualities of this fire creature, we learn to trust our passions and intuition (or the fiery feelings within us) in our quest for enlightenment. To further your invocation of the fiery salamander traits, focus your attention on the South – this is the direction it is associated with. Without a doubt, the elemental salamander is a great personification of the fire element. It allows this traditionally viewed amphibian to take a new, stronger role with fast-paced energetic tones and vibes. With this article, you can ignite your understanding of the vehement personality behind the element of fire in easier, more personal and literal terms. Allow this to tap your inner musings into the consciousness and personality of the fire like Leo, Aries and Sagittarius and all of its transformative powers. You can use this same logic and inspiration in your quest with the other elementals of our lives. In fact, you can go beyond the realms of logic and trust the spiritual ingenuity surrounding you.